Winston Churchill had met Jan Christiaan Smuts when he returned from the Boer War in 1900. Elected to Parliament at the end of that year, he never again visited South Africa. Yet that country was to play an important part in his life for the next fifty years. Churchill had a powerful personality, with unbounded confidence and faith in his own star. It is difficult to imagine him considering anyone his equal. He had high regard for Franklin Roosevelt, though by early 1945 his esteem had slipped, except on the personal level. Churchill also had his intimates, such as Lords Beaverbrook, Birkenhead, Bracken and Cherwell. But they were in a somewhat different category; most would not have thought of themselves on the same elevated plane. Smuts was a man whom Churchill regarded not only as an equal, but in many ways superior to himself. To understand how this came about, we need to know something about the great South African. Smuts was an Afrikaner whose ancestors came from Holland in the mid-17th century, at the very start of Dutch settlement. He was born in 1870, four and one-half years before Churchill. He grew up on a farm and developed into a natural countryman, botany being his expertise. Growing up in a Boer region of Cape Colony, he heard no English until went to school. A clever young man, Smuts came to England to read Law at Christ’s College Cambridge. He came in first in both parts of the Law tripos (final honours examinations)—an unprecedented achievement. He then briefly practised as a barrister at the Middle Temple in London. Returning to South Africa, he became State Attorney of the Transvaal at 28. In the years preceding the Anglo-Boer War he was a closer advisor to President Paul Kruger. 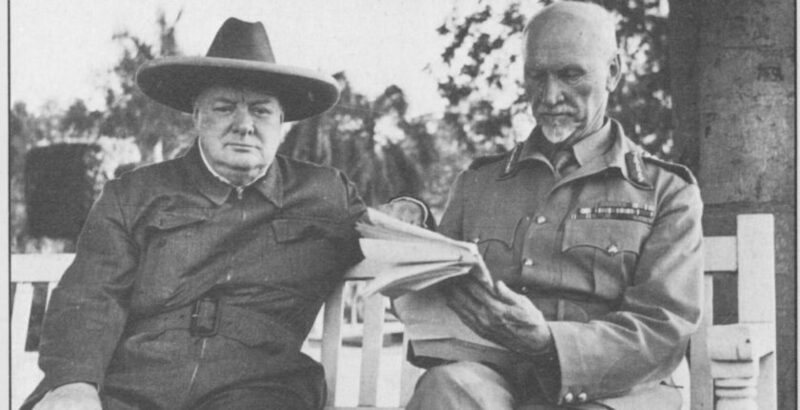 At one of their meetings during World War II, Smuts told Churchill something he did not previously know. Smuts at first opposed young Winston’s release. Later he considered Churchill (a presumed non-combatant) only technically guilty and favored his release. Meanwhile, the prisoner decided to release himself. For the last two years of the Boer War, Smuts was a general, leading commandos through brutal terrain in many a skirmish against the British. By 1902, however, he saw that the war was lost. He thought it sensible for the Boers to obtain the best terms they could get. He helped persuade Boer leaders to this point of view, in order to rebuild their country. For this he was seen by many hard-line Boers, who wanted to fight to the bitter end, as having betrayed them. It caused him political difficulties right up to his death nearly half a century later—though, very fortunately, he was able to overcome these at critical times. In 1906 Smuts came to London to discuss his country’s future. The British minister with whom he negotiated was Winston Churchill, Under Secretary of State for the Colonies in the new Liberal government. Smuts told Churchill it was in Britain’s interest to grant responsible self-government to the Transvaal and Orange River Colony. Churchill was sympathetic to this view and did his best to make a fresh start by urging a new policy of impartiality by the British administration between the Boers and the British settlers in South Africa (in contrast to the outgoing Conservatives, who had been seen by the Boers as anything but impartial). The British Cabinet accepted this view, partly due to Churchill’s advocacy and partly to the favourable impression Smuts made on the Prime Minister, Sir Henry Campbell-Bannerman. Internal self-government of the two Boer states was granted within a year. This paved the way for the establishment in 1910 of the Union of South Africa, a Dominion like Canada. In 1910, Smuts was elected to the South African Parliament and became a government minister. When the Great War began in 1914, many Boers wanted Germany to win, taking revenge on the British. A rebellion broke out in South Africa. Prime Minister Louis Botha and Smuts, now Commandant-General of the Forces, defeated it. They used pro-government Boers, not British elements, to restore the situation. While not abandoning his Afrikaner identity, Smuts strongly favoured imperial solidarity, and South Africa joined the Allied side. Later promoted to Major General, Smuts partnered with Botha in seizing the neighbouring German colony of South West Africa (now Namibia). He was responsible for clearing the southern half of that vast territory. Promoted to Lieutenant General, Smuts became commander of all Britsh, South African, Rhodesian, Indian and African troops fighting the Germans on the border of British East Africa (now Kenya) and German East Africa (now Tanzania). For the next year he drove the foe several hundred miles deep into the hinterland, overcoming the cruel climate and disease. In early 1917 Smuts withdrew from his command to lead the South African delegation to an Imperial Conference in London. He made such an impression that Prime Minister Lloyd George asked him to stay and join the British war cabinet. He then chaired the War Priorities Committee—one of whose members was the Minister of Munitions Winston Churchill. Not long returned from commanding 6th Battalion, The Royal Scots Fusiliers, on the western front, Churchill was back in government. Although they had met earlier, they now saw each other very frequently. Over the next eighteen months their mutual admiration and close friendship began. When the war ended, Smuts played a prominent part at the Peace Conference. He was a lonely voice in denouncing the conditions imposed on Germany. He said they were too harsh. They would lead to further trouble. Smuts also conceived the major portion of ideas subsequently incorporated into the constitution of the League of Nations. He then went home, two-and-a-half years behind schedule. On the death of Botha in 1919, he became South Africa’s prime minister, and held this post for five years. When World War II began in 1939, history tried to repeat itself. South Africa’s pro-German Prime Minister James Hertzog moved in Parliament that the country remain neutral. Smuts put forward an amendment to sever relations with Germany and to meet Commonwealth obligations. The amendment carried, 80-67; Hertzog consequently resigned and Smuts became prime minister again. Absent Smuts, the Allies would not have had use of the Cape route when Mediterranean shores were in hostile hands. The ability to reinforce and resupply British armies in North Africa, the Middle East, India and the Far East would have been seriously curtailed, and the strategic consequences would have been profound. Not enough recognition has been given by historians to the major importance of this parliamentary victory by Smuts. In 1941 Churchill suggested to the King that Smuts should be appointed an honorary Field Marshal in the British Army. The King agreed, although the South African always preferred to be known as “General Smuts.” The King also appointed him to the Order of Merit in 1947. Readers of Churchill’s The Second World War will notice how time and again he consults Smuts at critical periods. There is a stream of lengthy two-way messages, with Churchill rehearsing his thoughts and keeping the South African fully informed. Smuts always attended meetings of the war cabinet during his regular visits to Britain. 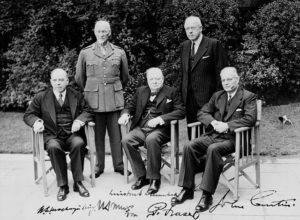 Leaving for the Teheran Conference in 1943, Churchill even toyed with the idea of leaving Smuts in charge at Westminster. This could have led to considerable political or constitutional difficulties, but no doubt a formula could have been devised. As early as 1940, John Colville, the PM’s assistant private secretary, thought Smuts should replace Churchill if he were to die. Colville even passed this idea to his mother, a lady-in-waiting to Queen Mary likely to filter it to the King. “Churchill was beaten at this game once—the only time I ever saw him defeated…At about 1 o’clock Winston said, ‘Well, now we will start work.’ ‘No,’ said Smuts, ‘I am not going to be a party to your murdering the British Chiefs of Staff. Here they are, they have to be back in the office by 9 o’clock in the morning, ready for meetings at 9:30. You will still be lying in bed with a fat cigar, dictating to your secretary. “That is why Winston is indispensable. He has ideas. If he goes, there is no one to take his place.” -To Lord Moran, Cairo, 1942. “Your courageous attitude has my complete sympathy.” -To WSC, approving cooperation over moves against Vichy reinforcement of Madagascar, 1942. “The British people are united to a man behind the greatest leader they have ever had.” -Speech at Guildhall, London, 1943. “Take great care of Mr. Churchill; he is one of the greatest men the world has ever known.” -To Detective Inspector Walter Thompson, Cairo, 1943. “Smuts, with all his wisdom, and from his separate angle of thought and fresh eye, concurred.” -Referring to the decision to aid Greece, 1941. “His mind moved majestically amid the vagaries of Fortune.” -On the loss of a South African division at Tobruk, 1942. “He is as I imagine Socrates might have been.” -To Anthony Eden, 1942. “Smuts and I are like two old love-birds moulting together on a perch, but still able to peck.” -To the South African High Commissioner, 1945. “My faith in Smuts is unbreakable; he is a great man.” -To Brendan Bracken, 1946. What an accolade from such a source. Paul H. Courtenay, a faithful Churchill historian and researcher, served for many years as secretary of the International Churchill Society (UK). He is co-editor of new ISI editions of Churchill’s Thoughts and Adventures and Great Contemporaries. We recommend these editions with their up-to-date endnotes.